Don’t be fooled by the new badge and the subtle tweaks here and there: at its core, the Genesis G80 is essentially a lightly modified Hyundai Genesis sedan, with a couple of updates here and there as part of the Genesis model’s transition into a new, luxury-oriented sub-brand for Hyundai. As a result, there’s very little that this Genesis G80 does differently to the Hyundai Genesis it technically replaces. It rides and handles well, offers decent refinement and practicality and – in quite a few ways – stands out as an enticing value-oriented proposition in a class known for higher sticker prices and options lists as overwhelming as they are often extortionately expensive. Yes, in a market dominated by brand perception, the established marques will obviously find more buyers for their cars than the fresh-faced Genesis will for its G80. Nevertheless, those who decide to give it a shot will find an unsung, well-rounded executive sedan in the Genesis G80. Though it is positioned as a high-end executive sedan, the Genesis G80 doesn’t quite do enough to trouble the best in this segment when it comes to interior build quality. For sure, the abundance of leathers, plastics and in some cases wood trim does lend an upmarket aura to the G80’s interior, but we’d be lying if we said the overall fit-and-finish here is able to give the interior designers at Audi and Mercedes-Benz sleepless nights. Some slight ergonomic issues also affect the Genesis G80’s interior, with the controls on the center console being the most obvious example. Despite the tweaks that we made in its transition from a Hyundai to a Genesis, there’s still a cluster of buttons to contend with that aren’t immediately intuitive to operate. Admittedly, the obligatory steering wheel controls and the rotary dial that controls the multimedia interface do go some way to alleviating those issues, but it’s a shame that quibbles like these are present on a vehicle with such upmarket aspirations. Thankfully, that’s where a majority of our criticisms on the Genesis G80 come to a close. The interior, though not as high-end as we’ve already mentioned, is still a perfectly pleasant place to spend lots of time in. Better still, this quality is backed up with nicely supportive seats and ample head and leg room for the driver and the four passengers the Genesis G80 is capable of carrying. In fact, we’d go as far to say the Genesis G80 is right up there with the very best this class has to offer with regards to the passenger compartment volume. Likewise, the trunk’s also of a decent and useful size by class standards: at 15.3 cubic feet, it’s roughly above average when compared to rivals; ahead of the 14.1 and 14.3 cubic feet trunks available in the Mercedes-Benz E-Class and Lexus GS respectively, but a considerable margin behind the 19 cubic feet on offer in the Jaguar XF. It’s also worth pointing out that, whilst the trunk itself has a broad opening and the rear seat backs can be folded completely flat, the Genesis G80 only comes with 60:40 split-folding rear seats – a small criticism, yes, but one worth pointing out in a market that’s increasingly beginning to adopt a 40:20:40 layout. We’ve known the car has had those qualities since its original launch. It shouldn’t really come as a big shock to learn that the Genesis G80 is a comfy and refined sedan. We’ve known the car has had those qualities since its original launch as the Hyundai Genesis, and it’s kinda expected from a vehicle in this segment. The real surprise, though, is that the Genesis G80 is one of the better vehicles in this segment in these areas. The ride quality, for example, is really good, to the point where the Genesis G80 ranks up there with the likes of the Volvo S90 and Lexus GS as the more comfortable vehicles in this segment. Wind whistle and tire roar are also well suppressed, which further accentuates the Genesis G80’s more cruiser-oriented characteristics. Thankfully, all Genesis G80’s come with blind spot monitoring and reversing camera systems as standard. Better still, this prioritisation of comfort qualities hasn’t had a negative impact on the vehicle’s responses. Of course, if it’s outright dynamism you’re after, you’ll be better catered for by the Cadillac CTS, Jaguar XF and BMW 5 Series, and there is a bit of body lean to contend with during cornering, but the sizeable windshield and responsive, well-weighted steering means you can have confidence when placing the Genesis G80 where you want – and have a decent amount of fun doing so. Of course, being an executive sedan, there is the issue of a slightly chunky rear pillars that generate a bit of a blind spot out back. Thankfully, all Genesis G80’s come with blind spot monitoring and reversing camera systems as standard, so the thick pillars shouldn’t be too problematic. When the V6 is this good, why bother with the V8? We do advise you consider the smaller six-cylinder engine. The ‘no replacement for displacement’ die-hards amongst you may revel at the possibility of owning an executive sedan with a big, 5.0-liter V8 under the hood, but we do advise you consider the smaller six-cylinder engine that’s also offered in the Genesis G80 range. Of course, the 3.0-liter unit isn’t as powerful or as punchy as the 5.0-liter eight-cylinder (311-hp and 293 lb-ft, versus 420-hp and 383 lb-ft), but the six cylinder’s outputs are still more than enough to endow the Genesis G80 with a decent turn of pace. For sure, it won’t be quite as effortless as the 5.0-liter, but the 3.0-liter has enough oomph at its disposal to ensure the G80 can perform overtaking moves on the highway without much effort being required. A lot of that is down to the eight-speed automatic transmission that’s shared by both engines. With so many gear ratios to choose from, the engine should remain in its various sweet spots (higher revs during overtaking, due to the fairly peaky maximum power and torque outputs; lower revs when cruising along the road) for most of the time you spend driving the Genesis G80. Plus, the gear changes themselves are smooth and fairly quick (if not as instantaneous as the automatics in, say, the BMW 5 Series and the Jaguar XF), and the transmission does a good job at selecting the most appropriate gear when you’re not using the paddles behind the steering wheel to go up and down the ‘box. The eight-cylinder model, as with the standard six-cylinder model, is only available in rear-wheel drive. Another key selling point for the six-cylinder is that it’s the only engine in the Genesis G80 range that’s available in all-wheel drive (the eight-cylinder model, as with the standard six-cylinder model, is only available in rear-wheel drive). It won’t matter a huge amount to some buyers, but it’s worth pointing out for those who’ll genuinely need to have an all-wheel drive vehicle when the weather makes a turn for the worst. Fitting all-wheel drive, though, does already have a noticeable impact on the Genesis G80’s already unimpressive fuel economy figures: all-wheel drive models can only return 16mpg in the city and 25mpg on the highway, with rear-wheel drive G80s able to return 18mpg and 28mpg in the same respective categories (for reference, a rear-wheel drive Jaguar XF with a similarly-sized and more powerful six-cylinder engine can return 23mpg in the city and 29mpg on the highway). The eight-cylinder engine is unsurprisingly even worse in this regard, with claims of 23mpg on the highway and just 15mpg in the city. With a new 3.3-liter twin-turbocharged six-cylinder engine set to be introduced to the Genesis G80 range sometime next year in between the existing 5.0-liter and 3.0-liter units, we really can’t see an objectively sound reason to go for the eight-cylinder engine over the six-cylinders. The best value executive sedan on sale today? For sure, upgrading to the Premium Package gets you all the extra items that come on the 5.0-liter model as standard. Of course, saying a car with a sticker price of $41,400 offers “good value” is an absurd thing to say in isolation. By the standards of the mid-sized executive sedan marketplace, though, that claim does hold up to scrutiny: a majority of the Genesis G80’s competitors sit in the mid-to-high-$40,000 bracket, with vehicles like the Mercedes-Benz E-Class entering the fray with price tags in the low $50,000 region. Making the Genesis G80 even more of an attractive proposition for executive car buyers looking to save a few bucks here and there is the fairly impressive amount of standard equipment. 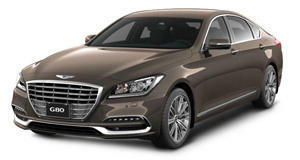 For sure, there are some unusual omissions (base six-cylinder models don’t come with parking sensors, for instance), but the Genesis G80 more than makes up for it by featuring leather upholstery, built-in navigation, a reversing camera, adaptive cruise control, blind spot monitoring, autonomous emergency braking, lane departure warning, heated front seats and power adjustment for the front seats and steering column as standard. Not only are a lot of those features optional extras on the Genesis G80’s more opulent rivals, but they also mean you can get away with leaving the car as it is. For sure, upgrading to the Premium Package gets you all the extra items that come on the 5.0-liter model as standard (including, but not limited to, ventilated front seats, premium surround sound, a 9.2-inch display to replace the 8-inch screen and front and rear parking sensors), but the package will set you back $4,750, so we’ll let you decide if the extra features are worth spending that much money on. The five-years/unlimited mileage warranty is already impressive enough. Perhaps the big selling point about the Genesis G80, though, is its phenomenal warranty. The five-years/unlimited mileage warranty is already impressive enough (and thoroughly tempting for company car buyers, considering the miles fleet vehicles can potentially rack up in such a short period of time), but it’s the 10-years/100,000-miles powertrain warranty that sets the Genesis G80 apart from its chief rivals. 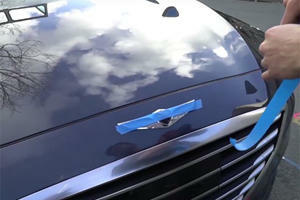 You even get complimentary servicing for the first three-years/36,000-miles, depending on which milestone is met first. A shame, then, that residual values aren’t that great. Though they have improved since the Genesis G80 was originally released as a Hyundai Genesis sedan, the resale worth percentage do lag behind the established premium marques, and especially the class-leading Lexus GS.